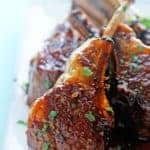 Balsamic Brown Sugar Lamb Chops - Savory goodness with sweetness to boot, these lamb chops will be your favorite new dish for entertaining. It's one the best lamb chop recipes you'll taste! Add olive oil to pan and heat over medium high heat. Season lamb chops on each side with salt and pepper to taste. Once pan is hot, sear the chops on each side for up to 2 minutes then remove chops from pan and let rest. Turn the heat down to medium low. Add minced garlic to the pan and cook for one minute making sure you don’t burn it. Next whisk in brown sugar, balsamic vinegar, cayenne pepper, and salt and pepper to taste. Allow the sauce to thicken. Add chops back into the pan, baste with sauce and continue to cook the chops until they are at your level of desired doneness. Remove chops from pan and place on serving platter.